Being South African, one of my favourite local dishes is hands down a comforting hearty Winter Bobotjie. I absolutely adore the Cape Malayan influence of anti-inflammatory spices that make this dish so warming and flavourful. Traditional Bobotjie can be very high in calories and unhealthy fats, but with a few simple ingredient swaps, this dish is transformed into a healthy, low carb, high in protein and healthy fats meal, that fits perfectly within a healthy lifestyle plan. 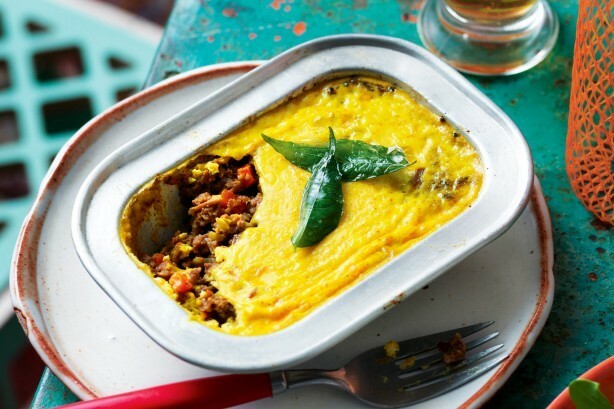 If you are vegetarian, simply swap out the ostrich mince for lentils or a frozen mixed vegetable medley. If you are vegan, replace eggs with 2 tbsp. tapioca flour. Heat the coconut oil in a large pot, add the onions and sauté on medium heat. Add all spices and cook until onion is soft, slightly browned and fragrant. Add ostrich mince along with 1 tsp pink salt and allow to simmer until the meat is cooked through. Whisk 3 eggs together with coconut cream and season with pink salt & ground black pepper. Combine remaining 2 eggs into the curried mince mixture and scoop it into a lightly greased oven-proof dish. Pour the egg & coconut cream mixture over the ostrich mince and place bay leaves on top. For batch cooking, simply cut into servings, place each serving in an airtight container (preferably glass) and freeze. Defrost servings as required.